New data from DriveMyCar (https://www.drivemycar.com.au), Australia’s leading peer-to-peer car rental marketplace, has shown that holiday-makers looking to book rental cars from the typical car rental companies for a week over Christmas in Sydney, Brisbane, and Melbourne will pay 3.3 times more than if they rented the same car this month. 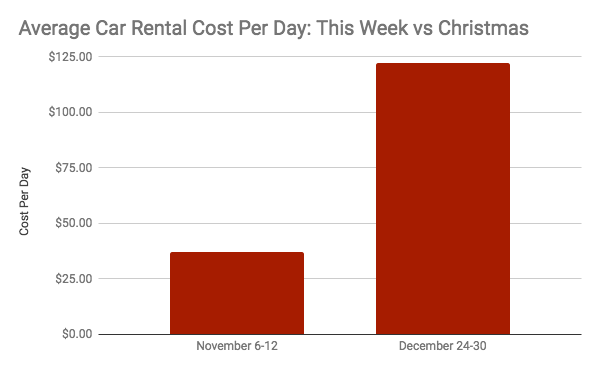 When renting an economy vehicle for a seven-day period, the difference between renting now versus over the holidays is an average jump of $595. Boycott the traditional car rental companies completely with DriveMyCar. This service rents out cars from private owners or direct from manufacturers and dealerships, which enables it to be up to 59 per cent cheaper than traditional car rental companies during the Christmas period. What’s more, you still get insurance and bonus roadside assistance. The range is also more diverse, with thousands of individuals listing their cars on the platform. TripGo enables you to make the most of your cheaper public transport options, by comparing and combining multiple transport modes, including train, bus, taxi, ferry, tram, car/bike, motorcycle and ride share. You can personalise trips, sync with your agenda and check costs ahead of time. TripGo also has up-to-the minute information on predicted departure and arrival times, GPS location, navigation and service alerts. What if you could solve your transport and accommodation needs with the one solution? Travelling by caravan can be lot of fun for youngsters and oldies alike, and it’s a great way to cut costs while being a lot closer to nature. You can save even more money – about 20 per cent off the usual rental cost – by hiring a caravan through MyCaravan. Ride-sharing can quickly become expensive if you’re regularly using it to get around. But if you’re not in an urgent rush to get to where you’re going, UberPOOL is a fantastic, low-cost alternative in Sydney and Melbourne that matches you with other riders heading in a similar direction. By sharing the ride, you share the cost and can save up to 50 per cent. An oldie but a goodie is simply carpooling with friends (or even strangers) who have plans to travel to the same or similar destination so you can all split petrol costs and driving responsibilities. For occasions like music festivals, it’s not uncommon to find people on Airtasker or Gumtree looking for lifts. There are also services like coseats.com, Carpool Australia and Share Your Ride that let you find other like-minded individuals for carpooling.